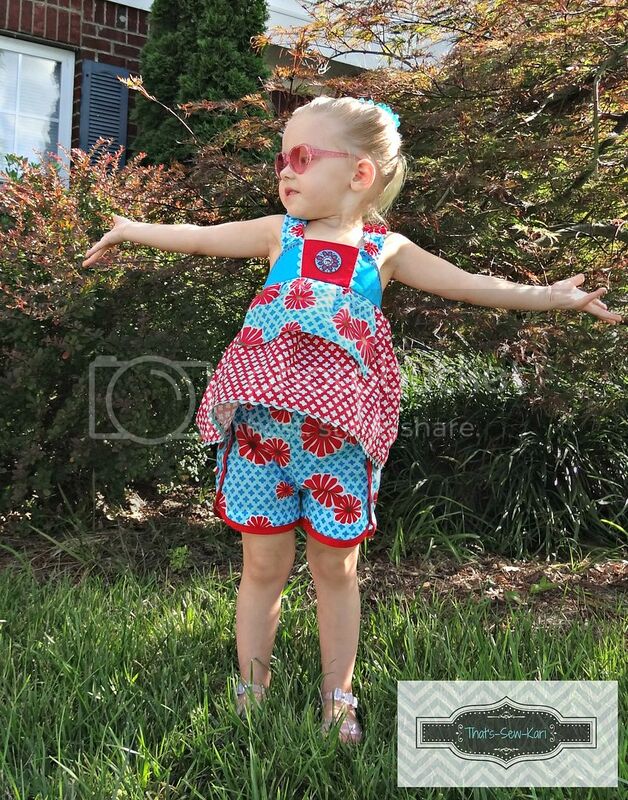 I recently had the privilege of testing a new shorts pattern, called the Seaside Short for Brownie-Goose. I already owned the Summer Sailor Shorts by Brownie-Goose (and a few more...LOL) and love them . I’m here to tell you, I love the Seaside Shorts just as much! 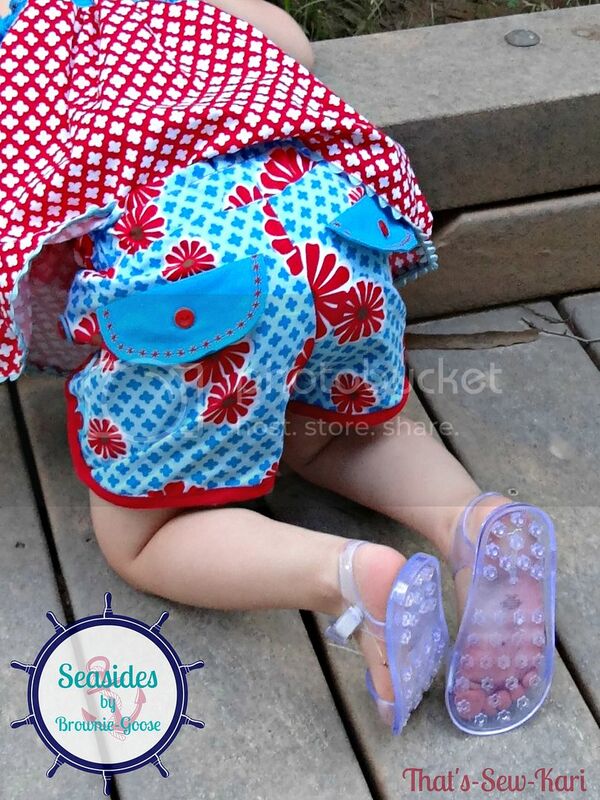 The Seaside Short is a cute little pair of shorts encased in bias trim with lots of buttons and faux back pockets. 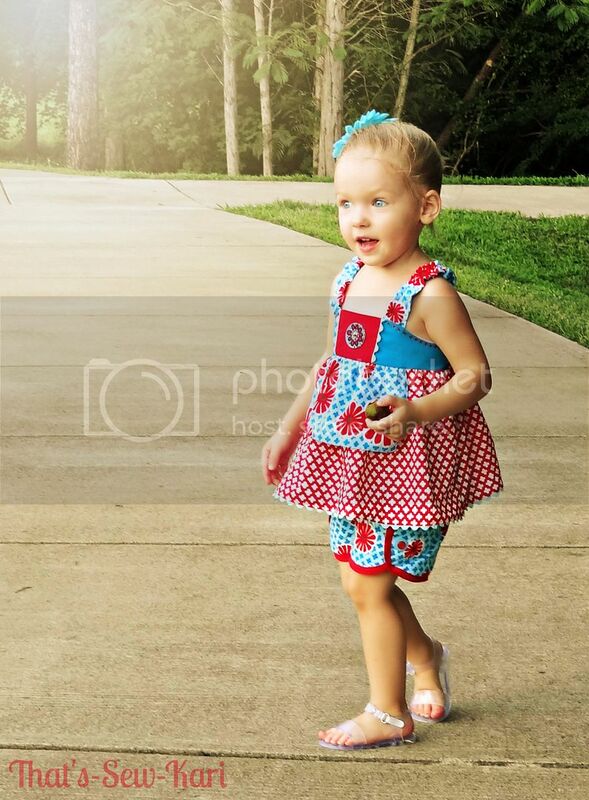 The size range is great – it goes from the itty bitty 6-12mo size all the way up to a 10/12! When I was asked if I’d review this pattern for Pattern Revolution, I jumped at the chance. I love this pattern and now I get to share with all of you… so let’s get started! All of the Brownie-Goose patterns come to you in 2 separate PDFs. I love this as I don’t have to figure out which pages to print to just get the pattern. The pattern pages are just 8 pages and color-coordinated by size. The pattern pieces are well marked, lined up perfectly and include grain lines! The instruction file takes you step-by-step with great photos and the famous Brownie-Goose humor. Seriously, it’s like Amy, the girl behind BG is sitting next to and you’re her BFF. I think she just spotted Amy Norris across the park! I don’t know if it’s just me, but trying to decide my fabric choices is always one of the hardest decisions and one of the longest parts of my sewing process. I always want to get it just right. And because I had to narrow it down to just one pair due to time constraints, I chose a red and aqua combo because it just screams summery fun to me. Did I mention this pattern teaches you how to make your own bias tape? Yep, it sure does and I had been doing it all wrong! I originally set out to use my own “made by me” bias tape and it’s actually all cut. However, I discovered my printed fabric wasn't perfectly printed on the diagonal like I thought so it totally screwed up my look I was trying to achieve. Wonky print would have driven me nuts so I used pre-made bias which still looked perfectly cute. Although I prefer the traditional way of sewing on bias, this pattern teaches you a “cheater” method to make the shorts construction even faster! Speaking of time, these shorts are a fast sew. Cutting and everything, you’re looking at a couple hours, TOPS (especially if your fabric is all picked out!). Okay, let’s talk about fit. 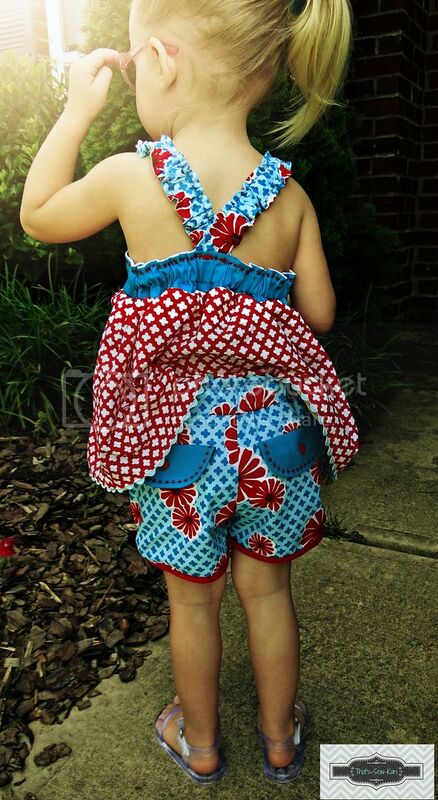 I made the size 2 for my cloth diaper wearing toddler. The fit was a bit snug for my liking in the fluffy bum area, whereas the Summer Sailors had fit fine over a cloth bum in the same size. For picture purposes, I used a regular disposable diaper and the fit was perfect. So if you’re a cloth-diapering mom, I’d size up. All in all, this pattern is going to be another success for Brownie-Goose! I just know it. I love everything about it – the bias trim, the buttons, and my favorite part – the faux pockets in the rear. 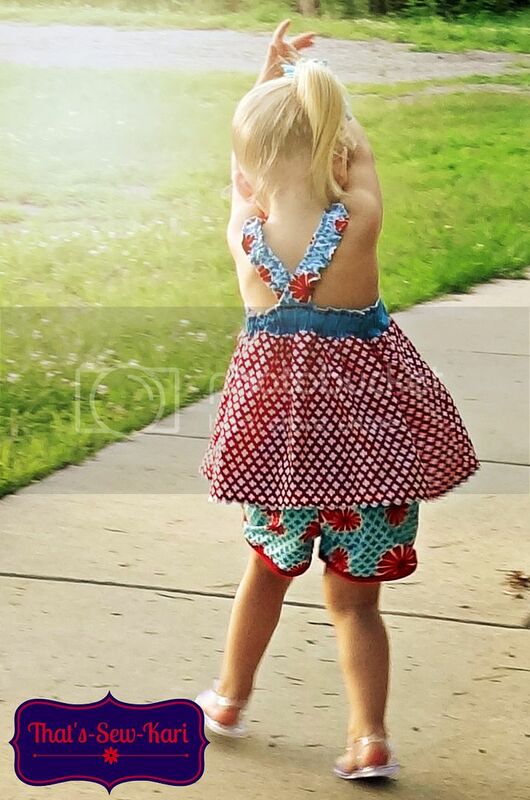 With different fabric combos, bias and button choices, you will truly create one-of-a-kind pair of shorts for your kids. 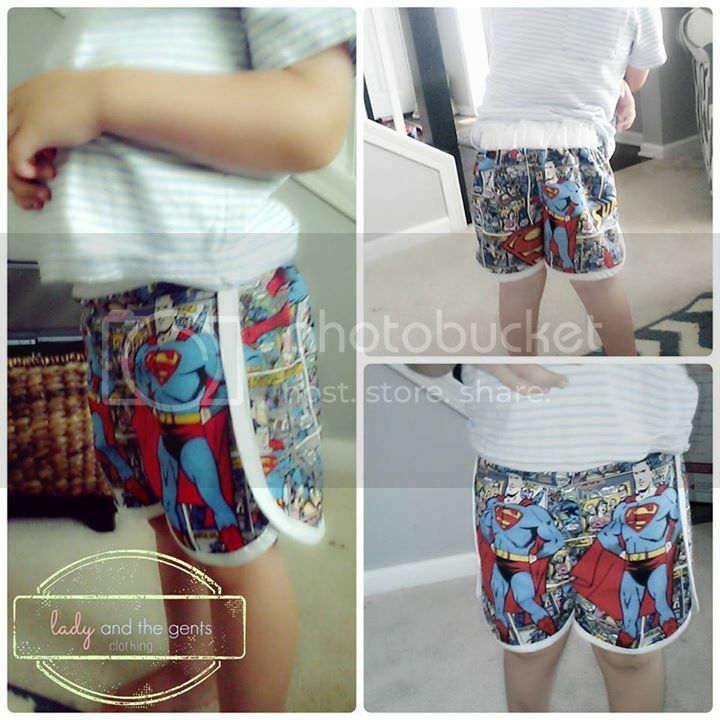 Oh, and if you haven’t seen, my sister-in-law, Emily made some awesome Superman Seaside Shorts for my nephews. Seriously cool. If you haven’t had a chance to try a Brownie-Goose pattern, what are you waiting for?! 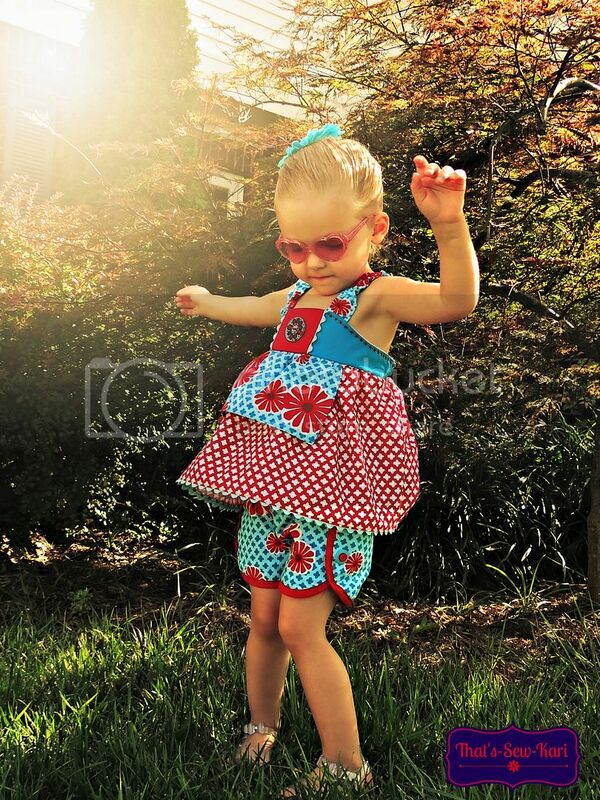 I have several of BG patterns and of course, many more on my wish list. Head on over to the Brownie-Goose Etsy shop and pick it up (and a few more while you’re there! I mean, who can resist?) This is a perfect pattern to get you started! 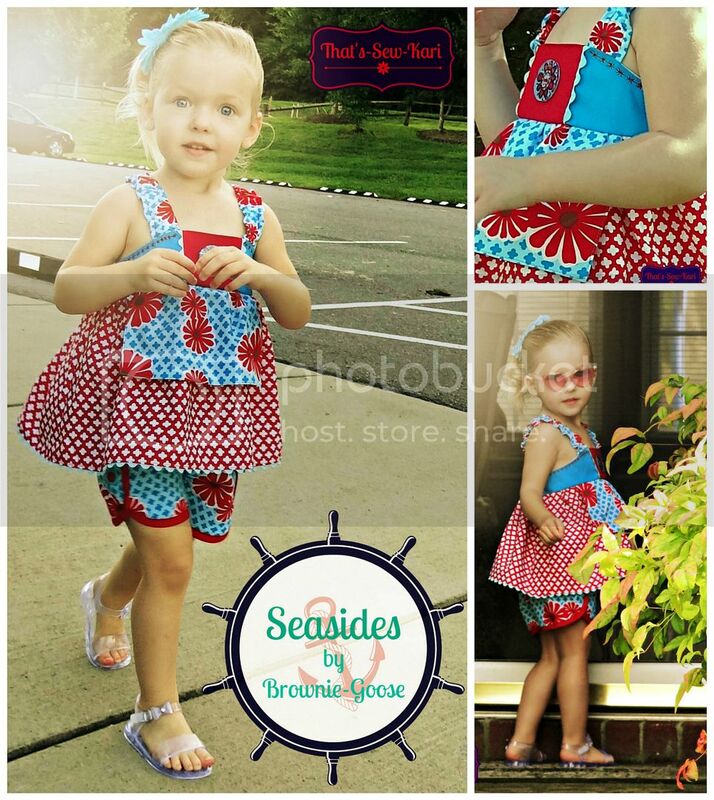 Thanks to Pattern Revolution for inviting me to review the Seaside Short by Brownie-Goose. And of course, a special thanks to Brownie-Goose – you were my first PDF pattern purchase and always continue to win my heart over. And testing a new pattern for you was just icing on the cake. Pattern Revolution has a giveaway for the pattern underneath my review on their blog... check it out (click here)! Maybe you'll win! Yahoooooos!! A new Brownie-Goose pattern! dress and undress herself without issue.